Melissa Rosenberg has gained a reputation for writing several successful projects involving women. Her previous credits include Dexter and the Twilight franchise, and she also has written a sadly-not-picked-up-to-shoot-yet pilot script for AKA Jessica Jones, based on the popular Marvel Comics series Alias by Brian Michael Bendis. Tonight, her newest TV project, Red Widow, hits the screens with a two-hour premiere on ABC, and who better to talk about the project than Melissa Rosenberg herself? We caught up with the prolific writer at a Red Widow premiere event this past week. Since we talked about so much, we’re running this in a Q and A format. Our questions are posted in bold. Don’t miss the series premiere tonight (March 3) at 9PM on ABC! KSITETV: Red Widow is based on a Dutch program titled Penoza. Can you talk about adapting the concept for a new audience? MELISSA ROSENBERG: You start with incredible source material. The original series, Penoza… that is why I chose to do this project, because I saw that original series, and I was so captivated by the characters. I started with some really great relationships that they gave to me. I enjoyed the hell out of it. Can you talk about the situation that the lead character, Marta Walraven, has found herself in? She’s a moral woman in a very immoral world, and she has to make some very questionable choices. She was raised by mobsters, which she has since distanced herself from, but somehow, that’s seeped into her DNA. It surprises her how good she really is at it, much to her dismay. She’s actually really good at it, and in fact, I think she will eventually discover that she’s better at it than most of the mob bosses around her. But that’s a very long journey. Right now, it’s just about getting herself out of it. She will do everything she can to get out of it and protect her children. That is her entire drive. How does she reconcile being a Mom with her new situation? The show — there’s an element of the Sins of the Mother, and her great sin for which the entire series, she is her seeking redemption for, that sin is complacancy. Basically, she turned a blind eye to what her husband was doing, and in the pilot, she is faced with all of the repercussions of it, including losing her husband, and the series is about all of the ramifications of that complacency, and about her digging herself out and ultimately finding redemption for it. Can you talk about the shooting locations for the show, as it is a very unique looking series? The series is set in Marin County, San Francisco. I was born and raised in Marin County, so I know it well. Unfortunately, it’s a little cost prohibitive to shoot there. I would love to shoot there. So we’re shooting in Vancouver, which is a great match for Marin. We sent a second unit up to Marin to cover some of the area, but we shoot in Vancouver. We have a very talented crew up there. A lot of the projects that you have worked on have had very strong female characters. Is that something that you find yourself drawn toward? Absolutely. I started a production company called Tall Girls Productions, for obvious reasons. The entire charter is to really create interesting, complex roles for women, either in front of or behind the camera. Not always necessarily leads. For instance, for me, with Dexter, the character of his sister, Deb, played by Jennifer Carpenter… that, to me, is a really fascinating character, and I loved writing for her. Here, I get to have my lead, and this is truly one of the most engaging characters I’ve ever had the pleasure of writing for. On that same note, is there still any hope for AKA Jessica Jones? I would love it. I love that series [the Marvel Comic Alias], I love the pilot I write for it… but its home is not on ABC, but we’re certainly searching for another home for it. Do you think that the subject matter of AKA Jessica Jones might be too much for broadcast television? I think it is. 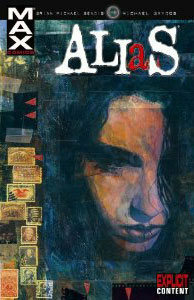 Jessica Jones was one of the first very adult comic books that Marvel ever did, so I would not want to tone that down any. Going back to Red Widow, do you think viewers will be surprised by Marta’s decisions? I think they will be. I think she’s surprised by her decisions! But the trick is to take the audience on that same journey with her, so that it makes perfect logical sense to them…. that they might, in the same situation, make the same choice. Or they might go “Oh my God! Don’t do that!” But she does it anyway. She’s going to be someone who mistakes — significant mistakes. All with the intention of protecting her children. But the character is a real human being with flaws, and that’s, for me, what is delicious. That’s what we really want to dig in and explore. Don’t miss Red Widow tonight! Further KSiteTV coverage of the project, including promotional images, can be found here.